It took a lot longer than most fans expected or hoped, but the Dallas Stars finally re-signed 23-year-old defenseman Brenden Dillon. The one-year, $1.25 million contract was signed October 2, allowing Dillon to join the Stars for their final preseason game, an intrasquad scrimmage in Cedar Park, Texas. While re-signing Dillon is a big relief for Stars fans, there is worry that this could all happen again in less than a year. The one-year contract provides some very affordable stability for the team this season and another chance for Dillon to showcase himself and earn the big pay raise he is expected to receive next summer. The hope here is that Dillon continues to build on his strong play of the last two seasons and an extension gets hammered out before next summer. Dillon will have arbitration rights next off-season so that could also push the Stars to a quicker signing. Negotiations seemed to take a turn for the worst last week when the Stars rejected Dillon’s two-year contract offer, the same contract fellow restricted free agent and teammate Cody Eakin signed earlier in the week. Dillon’s agent (who also represented Eakin) went public and voiced his camp’s frustration at the progress of the negotiations. In the end, Dillon said he had to chime in and make it clear that he didn’t want to miss any games. The Stars couldn’t really afford to start the season without him. General Manager Jim Nill spoke highly of Dillon during and after negotiations. He knows just how important the young defenseman is to the team. “Brenden is an important part of our group and we expect him to keep growing into the player we know he can become,” said Nill. The new contract came at a perfect time as Sergei Gonchar had just fractured his ankle and was expected to miss 3-5 weeks. Gonchar’s absence was a blow to the most worrisome and least improved aspect of the team: defense. Dillon will round out a defensive unit that looks very similar to last season’s, so he should continue to see valuable ice time on the second defensive pairing and on the penalty kill. 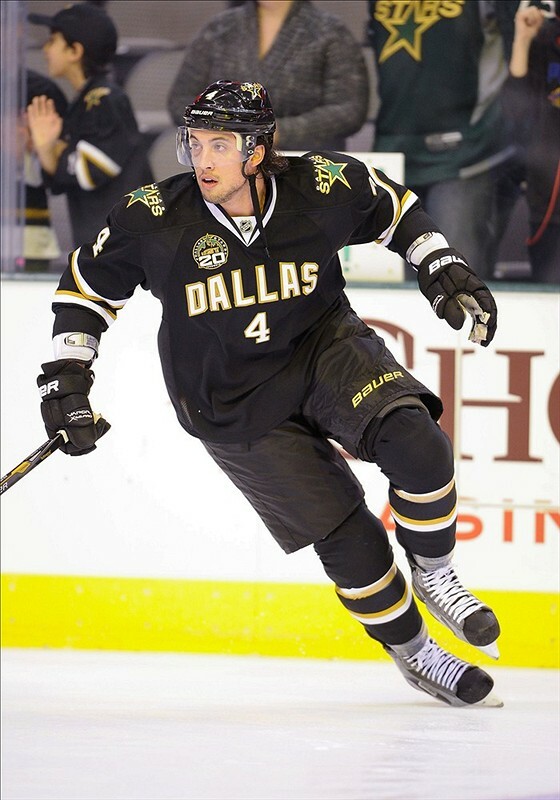 Dillon played a large role manning the Stars’ blue line since the lockout-shortened 2012-2013 season. The 6-foot-3, 225-pound undrafted defenseman skated in all but two games and registered 25 points and 151 penalty minutes over the last two seasons. As a rookie, he was paired with and mentored by veteran Stephane Robidas, and they developed strong chemistry on and off the ice. Dillon’s physical play and keen offensive instincts helped him earn a regular spot in the lineup, and he finished 10th in Calder Trophy voting. When Robidas and Trevor Daley suffered injuries last season, Dillon saw an increase in his role and ice time and was even paired with rookies at times to help ease them into the lineup. His 21:06 of average ice time last season was third-best on the Stars. He finished the season with the most shots and highest Fenwick despite facing the toughest competition among Stars defensemen. His Corsi and plus/minus ratings also improved from his rookie campaign. Though he isn’t a top-pairing defenseman yet, Dillon has shown that he is capable of being one. He is a cornerstone of the team’s defense for the foreseeable future, and that doesn’t usually come cheap. Fortunately for the Stars, there should be more cap room to work with next summer as several high-priced contracts expire after this season. For now, Stars fans can sit back and enjoy watching Dillon try to push the team back into the playoffs this season. He might need a little time to shake off some rust and get used to game speed again, but Dillon will be dressed and ready to go on opening night, eager to win, eager to continue developing and eager to earn his next contract. “I’m just glad to have this stuff done and get back to doing what’s important, and that’s playing hockey,” said Dillon. I think Stars fans can all agree with Dillon on that.